Caitlyn Jenner candidly discusses the status of her relationship with her ex-wife, Kris Jenner, and maintains that Kris was well aware of her gender identity issues when they first met, though Kris has said that isn't true. Larry King: When you got married, were you in love? 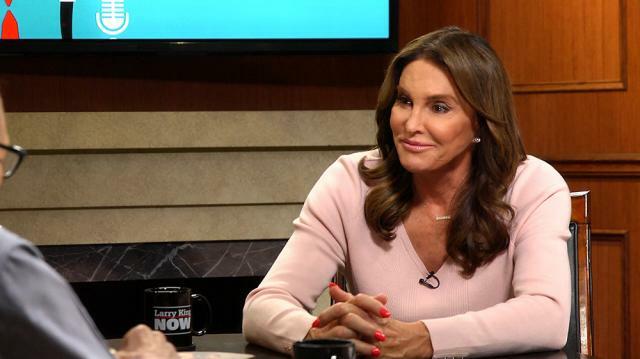 Caitlyn Jenner: Yeah, oh yeah, I was in love. Been married three times, well take the last one with Kris, I was open with her about my issues. I had been on hormones for four and a half years, and really struggling, back in the late eighties. Larry King: How’d she handle it? Caitlyn Jenner: She says, “We can handle it.” And at that time, in my life, because I couldn’t do it—I thought I would transition before I was 40—I said, “I’m doing this, I don’t want to be old and do this, I want to do it when I’m younger,” so that was like 1984 to 1990. Those six years, I was on hormones, I had a little bit of surgery done, I had all my electrolysis done on my face, and had all these things I was going through, thinking, “I’m going to do this before I’m 40.” I get to 39, could not go any further. It just wasn’t time. Within society, for me, it wasn’t time. And about four, five months after that, I met Kris. And we hit it off from day one. And I had to be honest with her. I am sure I downplayed it, because at that time I was downplaying it, and we both thought we can handle this, and not a big deal, and let’s have a good life together. So for the next 23 years, we had a very good life together. Larry King: Why is she so mad at this book? Larry King: She said, “I have never been so angry and disappointed in somebody in my whole life.” What annoys her? Caitlyn Jenner: A sensitive subject. Why? Because we have children involved here. First of all, I was always around very strong women, okay. And very opinionated women. And I raised that. Larry King: You were on my show with them. Caitlyn Jenner: Yeah, I raised them that way; strong, independent women. And you never really heard my side of the story. You never heard my opinion at all on that show. It was all everybody else’s opinion, and I kept my mouth shut and stayed in the back. Larry King: I asked you about that. Caitlyn Jenner: Yes, and I was fine with that. Larry King: You said it was their show. Caitlyn Jenner: It was their show. And I stayed in the background. So finally, in doing this book, and I talk about it in the first part of the book, saying, “This is my book. This is telling my story.” I’m extraordinarily honest, I have no malice in my heart, no nothing, this is my story. Caitlyn Jenner: Just that things like, oh she didn’t know—of course she did—but I’m sure I was downplaying it. And just things like that. It’s my opinion of things that happened. Larry King: You’re not speaking now? Larry King: Are you hurt that she’s reacting this way? Caitlyn Jenner: Am I hurt? I’m disappointed. I can’t say hurt, I’m disappointed. Well our relationship, it’s a little strained right now, which is okay, but my relationship with my kids, they’re fine. And time heals a lot of wounds, and this and that, and I will never say a bad word about her, ever. She’s a really good person. She saved my life in so many ways.